There has been a significant news story occurring in our world since early December 2013. While the media has been giving it low priority, we believe it is very symptomatic of the times we live in and has a significant prophetic aspect. Remember our goal is to show you how Bible prophecy fulfillment is feasible in our times and thus we will show that the Ukrainian story is important from that aspect. The nation of Ukraine lies in a very strategic location, being located on the edge of other key countries (Russia, Belarus, Poland, Slovakia, Hungary, Romania, and Moldova). It is a nation that for most of its history has been conquered and occupied by its neighbors. It has been divided frequently over the tensions between neighboring empires. In the 17th and 18th century Russia, Poland, and the Ottoman Empire divided it. The 19th century saw it divided by Russia and the Austrian-Hungarian empire. For a short time after World War I it was independent. Until recent times it has been part of the Soviet Union, but now it is enjoying independence. In fact this is the longest period of independence in its history; eighteen years. Thus, over several hundred years, life in the Ukraine was on the edge as it tried to stay united, tried to avoid being in subjection to other countries, and tried to maintain a quality of life during those times of occupation. 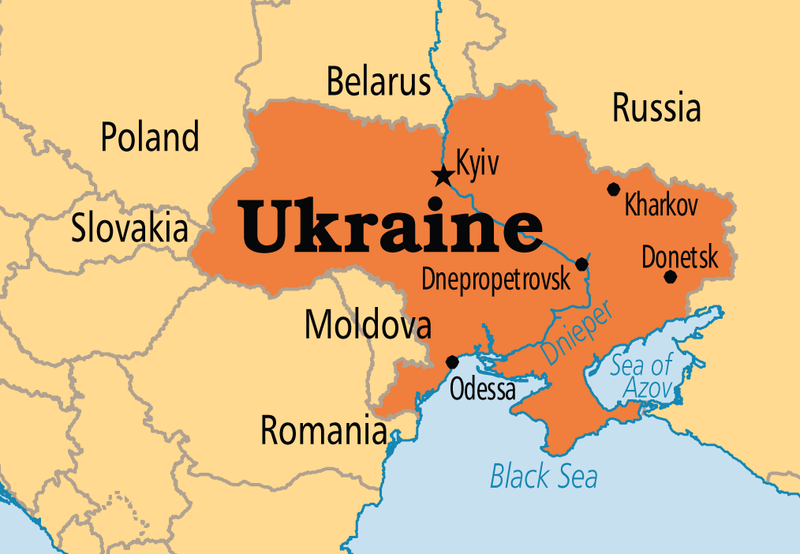 Interestingly, the name Ukraine means literally "on the edge." Once again the Ukraine and its current history has placed it on the edge again, this time between two significant powers; Russia and the European Union. Enjoying over 18 years of independence, the people want to stay independent and start enjoying the privileges associated with independence, including alliances that they choose rather than those forced upon it. Since December the country has been unstable as two groups of citizens clash over the country's future relationship to two great powers. The tensions have explode in significant demonstrations, given relatively little coverage in the US. Historically Russia has strong ties and influence over Ukrainian society. The Ukraine offers Russia at least two significant benefits in return. Russian gas pipelines run through the Ukraine and Russia wants to maintain control of this profitable business. The natural gas is needed by Europe and its transport under Russian facilities and price controls increases Russian profits. Most important to Russia is the Black Sea Ukrainian ports of Odessa and Sevastopol. These allow Russia access to commercial and military exports, in addition to energy exportation. The Black Sea gives them access to the Mediterranean and its markets. Russia not only is seeking commercial gain, but sees the Ukraine as a vital part of its national security. It offers protection to Russia from Western Powers, forming part of a defensible 1000 mile border. Russian analysis, steeped in history, always looks to the distant future. It does not consider the current peaceful situation as necessarily ongoing into the future. And it is that distant future that worries Russia and influences many of its present policy decisions. The European Union has a long term goal also. It was founded upon the idea that long term peace and prosperity comes from a single empire in control over Europe and the western hemisphere. Some have suggested that ultimately a total of 109 countries will achieve the EU dream. [See our book on the European Union for a list of those countries and an in depth discussion of what follows]. Just as Americans of the 19th century believed in a Manifest Destiny, so too, the EU believes its destiny is to become the European empire (including its descendents in the western hemisphere). With the Ukraine on Poland's border [Poland is a major economic power in the EU], it is natural to seek the Ukraine as part of that destiny. Since the Ukraine offers the EU relatively little gain other than geography, the driving force for EU expansion is only explained by its "Manifest Destiny." This closely parallels what we would expect to see driving the final empire of history, just prior to Christ's earthly kingdom. Biblically, the book of Daniel, chapters 2, 7, and 8 outline the succession of empires from Babylon to Mede-Persians to Greece and finally Roman. The final empire will be the continuation of the ancient Roman Empire, reformed and inclusive of what I call "historical descendents" of that ancient empire, such as North and South America. If we consider the current European Union and include those part of the EU Neighborhood nations (nations that are loosely aligned with the EU and gaining many benefits as neighbors. They are also considered on the path to joining the Union), you find a perfect match to the extent of the ancient Roman Empire. It is this reformed Roman Empire that will be defeated and destroyed with the coming of the Lord Jesus Christ at the end of the Tribulation's seven years, according to the book of Daniel. Interestingly, only a portion of Ukraine was part of that ancient empire. As in the past, even today, there are those talking about a divided Ukraine—one part European and one part Russian. Since December there have been demonstrations (at times violent) over the issue of the Ukraine joining the EU or realigning with Russia. A group of young Ukrainian financial analysts and traders have suggested splitting the Ukraine "into two countries, east and west". Economic people classes in the Ukraine are also suggesting division. The rising young generation is at odds with the older ruling generation, a generation patterned after and aligned with Russia. People are dividing over which form of independence they desire: EU membership with its "transparency and rule of law" versus the authoritarian form of government similar to Russia's that was in place prior to the Orange Revolution of 2004/5. Despite the government's latest regulations against any pro-European Union demonstrations, the demonstrations continue in Kiev and bear watching. Prophetically we see an example in our day of how a country could divide and actually return to the ancient boundaries of the ancient Roman Empire. An action, we would expect based upon the ultimate final form of the Roman Empire. Whether the Ukraine remains "on the edge" and divides its allegiance or whether there is a physical division, we must remember that God's Word is correct and prophecy will be fulfilled. "For yourselves know perfectly that the day of the Lord so cometh as a thief in the night. For when they shall say, Peace and safety; then sudden destruction cometh upon them, as travail upon a woman with child; and they shall not escape. But ye, brethren, are not in darkness, that that day should overtake you as a thief. Ye are all the children of light, and the children of the day: we are not of the night, nor of darkness. Therefore let us not sleep, as do others; but let us watch and be sober...putting on the breastplate of faith and love; and for a helmet, the hope of salvation. For God hath not appointed us to wrath, but to obtain salvation by our Lord Jesus Christ, Who died for us, that, whether we wake or sleep, we should live together with him" (1 Thessalonians 5:2-11).